A nice way to start off a Saturday is a visit to a typical farmer’s market near the water. 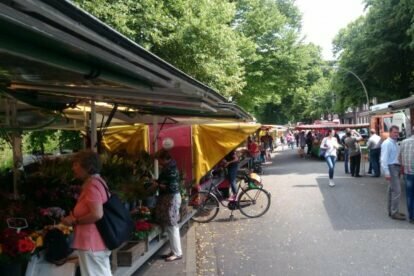 All the vendors here at Goldbekmarkt are aligned right by the Goldbekkanal (a small channel which is part of the Alster) in the lesser known neighborhood of Winterhude. You want to shop for some fresh fruit, flowers, fish or local delicatessen? Well, this is the place. You just want to wander around, have a coffee and a croissant or a beer, a bratwurst or a hot soup? They have the right food stall for you here. It is all cosy and very friendly. The best thing about this market is its location. The channel is just charming. There is a nice playground to drop off the kids. You might also take a stroll through the nice neighborhood. No tourists here. Walk down the two bigger streets (Muehlenkamp or Dorotheenstrasse) to find neat little shops and cafes. In the summer, you should take the chance to get back to the city by Alster boat (see link for schedule). Or just spend the day and learn how to pronounce ‘Winterhude’ correctly.